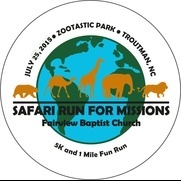 This 5k at Zootastic Park is a fundraiser for Fairview Baptist Church missions locally and abroad. This Safari Run For Missions will assist Fairview Baptist Church with several Mission Partnerships that we support through our ministry. We have several of our members participate in various mission opportunities throughout the year. We are involved in local missions here in Iredell county as well as North Carolina Mission opportunities as well as International Opportunities.